Wild blueberries; photo by Nadia Prigoda-Lee (the_girl) on Flickr (use permitted with attribution). 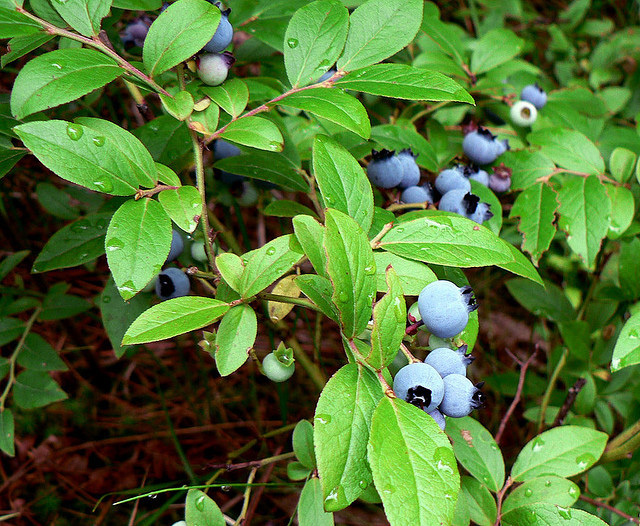 Wild blueberries are found mostly on hilly and rocky terrain. These delicious native berries were, until recently, harvested exclusively by hand using a special rake invented over 100 years ago by a Mainer (Abijah Tabbutt). Mechanical harvesting methods are now sometimes employed, but the close-tined hand rake will always have a place because of the difficult terrain where many blueberry patches grow. Wild blueberries can be picked from late July to early September in Maine.